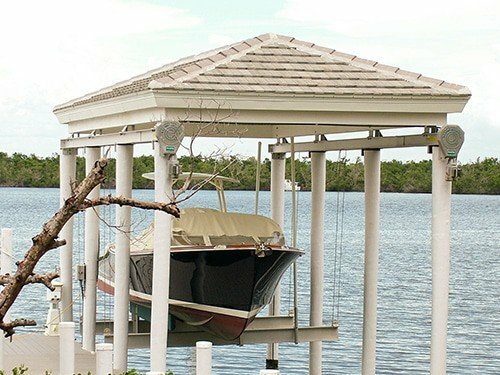 Imm Quality Boat Lifts has many solutions for your boathouse lift needs. 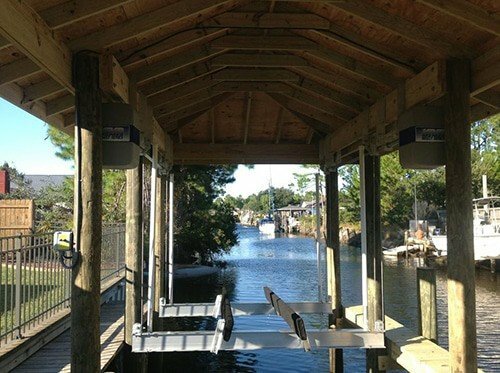 Our boathouse lifts can be built to be a structural part of your boathouse using custom stringer brackets welded to the top of a beamed boat lift to support the outer support bands of the roofing system. We can retrofit your existing boathouse using custom welded side mounting brackets. Lift hanger bearings are the most common and effective way to mount a lift inside a new or existing boat house. The bearings are fastened to the hanger assembly which then slides over the stringer bands of the boathouse. Once in place, the brackets are fastened to the bands using stainless steel bolts and requires no drilling of the bands. Suspension Brackets allow you to hang a standard 4 pile lift in various positions along overhead support beams and gives full adjustability in all directions. Available in seven sizes up to 27,000 pounds.